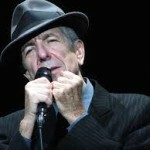 “Bird on the Wire” is one of Leonard Cohen’s signature songs. It was recorded 26 September 1968 in Nashville and included on his 1969 album Songs from a Room. A May 1968 recording produced by David Crosby, entitled “Like a Bird”, was added to the 2007 remastered CD. Judy Collins was the first to release the song on her 1968 album Who Knows Where the Time Goes. In the 1960s, Cohen lived on the Greek island Hydra with his girlfriend Marianne (the woman depicted on Songs from a Room’s back cover). She has related how she helped him out of a depression by handing him his guitar, whereupon he began composing “Bird on the Wire” – inspired by a bird sitting on one of Hydra’s recently installed phone wires, followed by memories of wet island nights. He finished it in a Hollywood motel. Cohen has described “Bird on the Wire” as a simple country song, and the first recording, by Judy Collins, was indeed done in a country setting. He later made various minor changes, such as the modifications present on Cohen Live. Different renditions are included on all of his live albums. On occasion he also performed Serge Lama’s French version, “Vivre tout seul”, in concert. Kris Kristofferson has stated that those opening lines will be his epitaph. It was featured in a promo for an episode of the TV series Lost. A cover version of the song sung by Katey Sagal was featured in a closing segment of an episode, during the third season, of the TV series Sons of Anarchy. It was also featured in the TV Series Parenthood. Nigel Blackwell of the UK band Half Man Half Biscuit occasionally sings the opening lines of the song during live versions of his band’s song ’24 Hour Garage People’, after mentioning being able to hear the songs playing on Graeme the shop assistant’s iPod. A cover is featured in the concluding scenes of director Robert Altman’s 1978 film A Wedding. It’s a song about redemption. We all mess up, but we can make it up. It’s about feeling out of luck and down, but what we can find of ourselves through the remains. People find this difficult to understand unless they have felt that way, but all good poetry means something different to every person. The bird was built to sing on a wire without getting electrocuted. This was its “freedom”. The drunk and his midnight choir are simply made to do just that, drink and sing. The knight – why does he continue to survive these many battles? Because that is exactly what they were built to do – and being “in some old fashioned book” his fate has been predetermined. The second verse seems to take a more austere tone. The stillborn baby hurt those who tried to love him spiritually and emotionally. The beast with his horn ravaged the person who came near physically. Again, both kept to their primal natures. The baby hurt his parents simply by being loved and desired. The horned animal was only doing what instinct mandates. The beggar has nothing and says to ask for nothing more. The pretty woman presumably has everything and suggests we ask for more. How does this tie in with the rest of the song? Again, we have a contrast between the beggar who is resigned to accept his fate as deserving little, while the woman who has everything, wants more. This is what they are both programmed, or built, to do. So the moral of the story is, that life deals for you the hand that you believe it will.